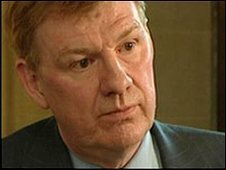 The chief medical officer for England, Sir Liam Donaldson, has said he is stepping down from the job in May. Sir Liam, 60, has held the post since 1998 and is also the UK's chief adviser on health issues. He championed the ban on smoking in the workplace and oversaw the response to swine flu. He also played a leading role in trying to restore public confidence in the MMR vaccine after fears had been raised about its safety. Sir Liam has been outspoken in defending the government's swine flu pandemic plans in recent months and if the pandemic should unexpectedly take a turn for the worse, he has told ministers he will stay on past May. Earlier this year, Sir Liam clashed with the government over plans to introduce a minimum price on a unit of alcohol. He said he was in favour of setting a price of 50p but this received a lukewarm response from Prime Minister Gordon Brown, who said he did not want to penalise the majority of sensible drinkers. Prime Minister, Gordon Brown, said: "He has made an extraordinary contribution to the nation's health, from championing the ban on smoking in public places, to tackling the shortage of donated organs and most recently leading our response to the swine flu pandemic. "His leadership and action in these areas and others will have saved many, many lives." Since 1998, Sir Liam has overseen the creation of the Health Protection Agency, making England smoke-free and creating new laws on the use of stem cells, organs and tissue. In his resignation letter Sir Liam said: "I have been pleased too, that reforms I proposed to improve quality and safety of NHS care - clinical governance, a patient safety programme, procedures to identify, and prevent harm from, poor clinical practice - are fully embedded in the service and have been also adopted in many other parts of the world." Health Secretary, Andy Burnham, said: "He has brought courage and foresight to the role of improving the nation's health. "His bold and once-controversial proposal to turn public places smoke-free shows the difference he has made." Chris Ham, professor of health policy and management at Birmingham University, said: "I think he will go down as one of the very best chief medical officers because of what he has achieved on the public health front. "Also for the leadership he has shown in making sure that clinical quality and patient safety are taken seriously in the NHS. "And for what he has done in transforming the General Medical Council and achieving much better accountability from doctors for their performance and standards."